The Sphynx is the only recognised hairless breed of cat in Australia. Hairless cats have been recognised in Mexico, France and Canada. 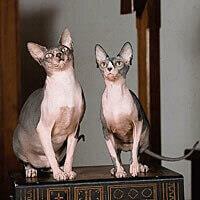 The modern day Sphynx was developed from hairless cats that sprang from a mutation in Ontario, Canada, in 1966. In truth this cat does have a coat, but it is a very short, almost suede-like coat. The coat on the face has been described as "looking similar to velvet and feeling similar to moss". This is a slender cat with distinct triangle-shaped ears, with wrinkly skin on the forehead and a robust barrel-shaped chest. The tail is long and narrows to a point, and not all of them have whiskers. The Sphynx is an extremely affectionate creature and will thrive in a house filled with people and other pets. The Sphynx is also the only cat that has sweat glands and so does not need to pant to keep cool similar to other cats and dogs. And because of these sweat glands they will have skin secretions that discolour its skin and so will need to be bathed from time to time to maintain a healthy coat. This wonderful cat has a medium-sized frame and is surprisingly heavy for its size. The head is wedge-shaped with prominent cheekbones and whisker pads giving a squared appearance to the face. The body is warm and soft to the touch. It is a sweet-tempered, lively, intelligent, and easy to handle cat. It is also easy to train, but it does enjoy being kept busy and with a lively household it will make itself right at home.